Throughout the city of Tel Aviv there are amazing and colorful works of graffiti and street art. The Florentin neighborhood in the south of the city has become one of the most famous centers of this art and its artists have become famous and the most famous ones are even invited to festivals abroad. On the walls, there is a rich world of ancient masterpieces and there are works by new artists as well as by artists who came especially from abroad. Come to a tour of graffiti and street art where we will examine the legality of this art, introduce the leading artists in the field, the differences between the different types of graffiti and art and try to understand what lies behind their works in the open color street museum and especially the dynamic, that every day something happens and something changes. Come on a tour of Florentin and get to know the most fascinating and popular art today. Want to visit this world’s famous graffiti and street art center in Florentin? Want to discover the secrets behind the walls – all about the famous works and artists? 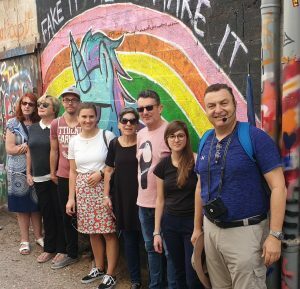 Come to Tel Aviv for a tour of graffiti and street art with Ronen! In south Tel Aviv, in the small Florentin neighborhood, adjacent to an industrial area and garages, there are excited nightlife, tattoo shops, galleries, vegan restaurants, bars and cafés and lots of young men and women. This is perhaps the last opportunity to see the magnificent street art on the walls of the old buildings and fences before they will be destroyed and replaced. The walls are filled with color, talent, inspiration and humor and create a huge, free public gallery.